Nihon Clinic is an integrated multi-specialty clinic established to meet the medical needs of Japanese people working and living in the United States. Currently, Nihon Clinic has two branches for Japanese expatriates. Both locations provide patients with meticulous, comprehensive medical services. Our professional staff is able to address all of the patient’s medical needs and help each patient remain healthy while living abroad. Nihon Clinic's highly trained medical and professional personnel are committed to your health and well-being. Our patients enjoy state-of-the-art medical care in a patient-friendly setting. 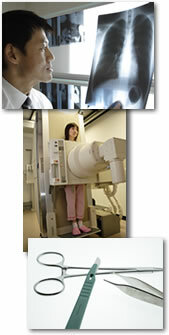 Furthermore, as part of our emphasis on preventive health care, we offer Japanese style comprehensive physical checkups. If you'd like to know more about Nihon Clinic and its services, please feel free to contact our staff at any of our locations in Chicago or San Diego.